Vijayanagar HSM-I and HSM-2 with commissioned capacities of 3 MTPA and 5 MPTA respectively are equipped with sizing presses and an automatic line inspection facility. HSM at Dolvi Works has capacity of 3.6 MPTA which uses a combination of the advanced Conarc Process and Thin Slab Casting technology, facilitating the production of HR coils. Due to their thinner gauges and finer surface quality, these are often superior to commercial grade cold rolled (CR) coils and may substitute for CR products in certain applications. The convenient coastal location of Dolvi unit facilitates easy access to plant and makes the import and export of raw materials and finished good extremely cost effective. 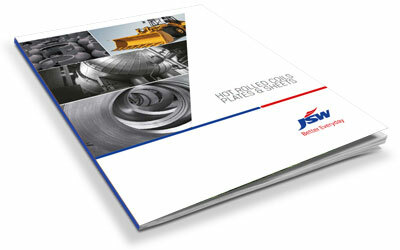 Range of HR products: Thickness upto 25.4mm, Width upto 2050mm and Coil Weight upto 36mt.